Note: This tutorial works on ROS Electric but has known issues in ROS Fuerte and ROS Groovy. Description: Stage (ver 3.0.0 and above) is equipped to work as standalone, wherein controllers integrated into stage enables motion, behaviour and processes for the robot(s). This tutorial discusses two such stage controllers. Those of us who have used Stage (or Player/Stage) would have probably used Stage to set up the environment and the robot and then to implement behaviour used a C++ or Python code or another ROS node. However, from Stage ver 3.0.0 onwards there is a facility of Stage Controllers; which enables some very basic behaviour inbuilt into Stage. 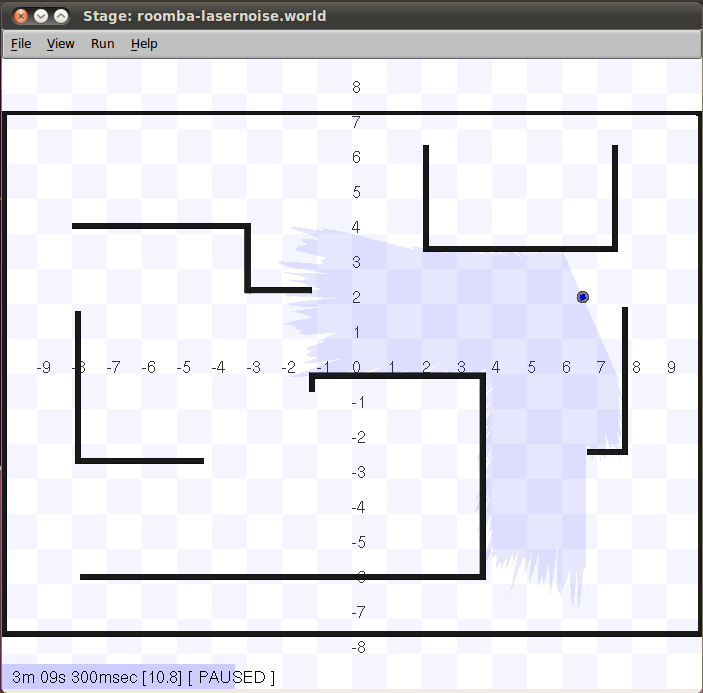 Thus, without using any other code script or ROS node it is possible to implement behaviour in the robot. The primary motivation for such was to develop Stage as a swarm robotics simulator - implement same behaviour to a large number of robots all at the same time. Download the codes from https://code.google.com/archive/p/mobotica/downloads and extract the stage_controllers file and make sure that it is in the ROS path. The following screen should pop up with the roomba robot wandering around. 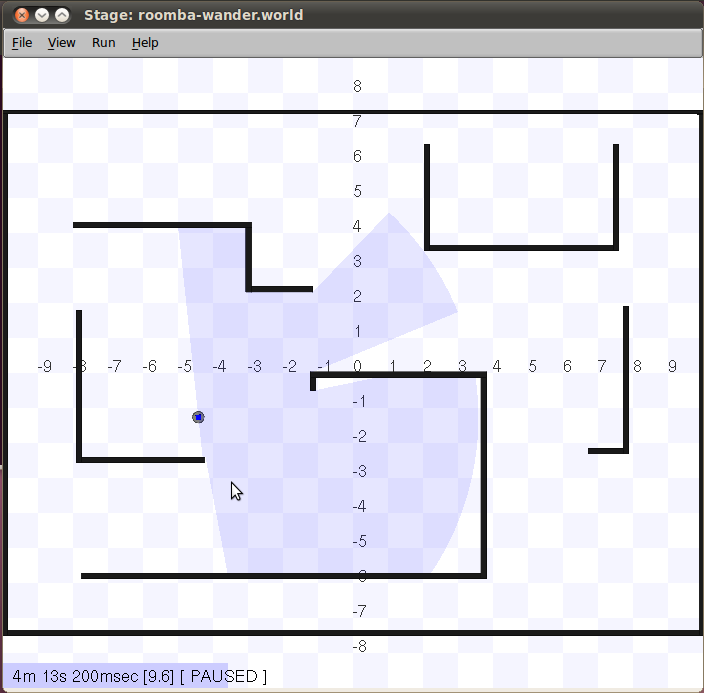 What is worth an appreciation is that robot's movement and obstacle avoidance is obtained from a world file and no other process had to be run in tandem. The following screen should pop up. Stage has other such controllers; some deal with multirobot tasks, swarm robotics etc. Later tutorials may discuss these controllers and also about writing custom stage controllers. Also, similar approach is possible in gazebo using the libgazebo client library to develop controllers.